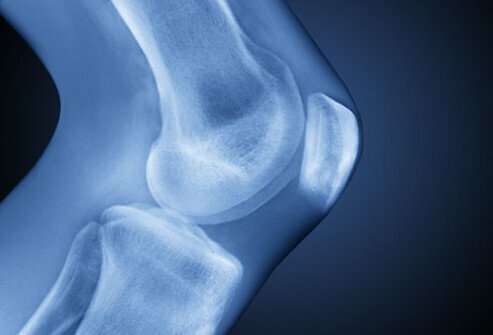 While both rheumatoid arthritis and osteoarthritis can lead to significant joint destruction and functional disability, there are many basic differences between these two forms of arthritis. 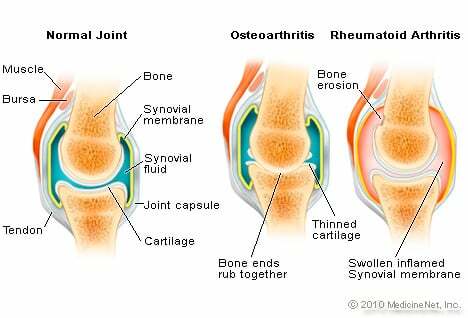 Rheumatoid arthritis is a destructive autoimmune joint disease that features inflammation in the joint lining tissue (synovium) that normally produces lubrication and nutrient fluid for joints. Osteoarthritis is a disease of the cartilage of joints. Osteoarthritis is not a systemic disease and not an autoimmune disease. 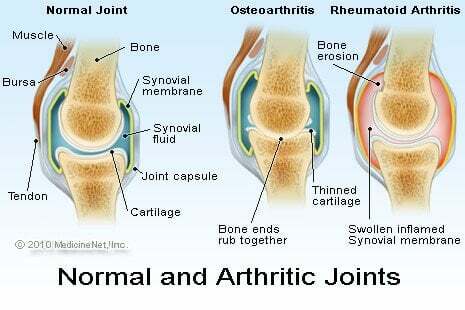 Osteoarthritis is partly a result of natural aging of the joint. The symptoms of osteoarthritis can vary greatly from patient to patient. What were your symptoms at the onset of your disease? What was the treatment for your osteoarthritis? Do you, a friend, or relative have osteoarthritis? Please share your experience. Do you have early symptoms of osteoarthritis? What steps are you taking for early intervention? Being overweight, wearing uncomfortable shoes, or carrying a heavy purse can make joint pain and arthritis symptoms worse. Some bad habits increase inflammation and put you at risk of osteoarthritis and rheumatoid arthritis. Protect joints and muscles and prevent swelling and joint disorders by eliminating these joint problem bad habits. Joint aspiration (arthrocentesis) is a procedure where fluid is drained from a joint with a needle and syringe for laboratory analysis. This may help determine the causes of joint swelling or arthritis.